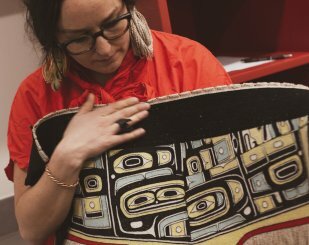 When you first meet Meghann O’Brien, a Haida, Kwakwaka’wakw, and Irish weaver and designer who is notable for her fine Chilkat and Ravenstail weavings and other works, you can tell that she is an artist right away. 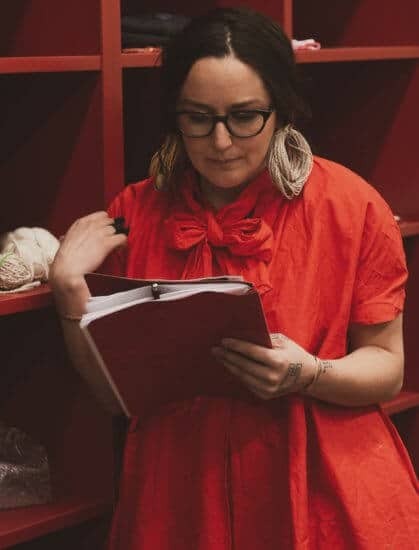 At the April 12th Welcome Dinner and Studio Tours for the latest artists-in-residence, she wore weaving materials as hoop earrings, and had a delightfully voluminous red dress with a big bow around the neck. The overall effect made me think she could be a heroine in a Hayao Miyazaki animation. Her commitment to her weaving is expressed in her body art—on the back of one of her hands, she has a black-lined tattoo of a motif found on some Ravenstail weavings, and she also has markings to denote weaving projects. When I met up with her for an interview, her shoes were two different colors, a vibrant orange-red and yellow, respectively. This is Meghann’s second time at IAIA. This year, she is participating through the Sunrise Springs IAIA Residency, a collaborative effort with the Sunrise Springs Spa Resort. Last year, she worked on a portion of a ceremonial apron. To give a sense of the time it takes to make one, she said she completed about a tenth of the piece in six weeks. I asked her about the differences in experience of last year compared to now. “I guess last year I was in the middle of a project I was really ready to finish too, so I was very focused on that,” Meghann noted. “So I put a lot of time in with that. But now, I am at the beginning of a new weaving project, which will take a few months of spinning before I am ready to hang it on the loom, so I have just slowly been getting back into that.” She also noticed that there was a growing interest in weaving, compared to her last time here. To create a Chilkat or Ravenstail robe represents many hours not only of weaving, but also preparing and spinning wool. She has spent a significant portion of her time during the residency engaging in this essential part of the process. “It’s so necessary, and it’s so beautiful, and it’s so over-looked,” she said. IAIA students got a taste of this aspect of weaving through a fiber spinning workshop. This year’s residency also marks a greater shift into fashion. 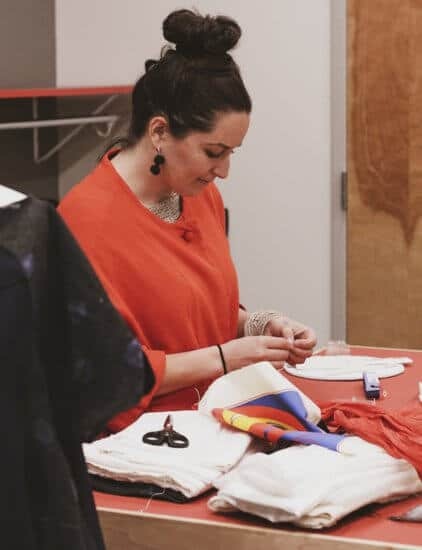 While Meghan has been focused on the creation of ceremonial garments in her weaving work, she’s also been exploring creating garments and accessories in a fashion context. Prior to coming to Santa Fe, she learned that she was going to participate in Indigenous Fashion Week Toronto. She brought fabric and then bought more with the funds from the residency materials budget. At Sunrise Springs, she has been focus-ing on her weaving, while at the campus in the Performing Arts Costume Shop, she’s been busy sewing. In the studio, she had strands wrapped around and pinned to a mannequin. During our conversation, she manipulated the strands and showed me how the material might become a sort of necklace, accented with a small weaving and incorporated as a structural and decorative element of a Western-style garment. I was fascinated by the way she can not only work in a framework of fine precision but also with such a freeness in her creative approach. “I’ve always loved and been obsessed with the warp,” revealed Meghann. “Just like having it, and looking at it, and the way that it moves, and the structure of it is really cool…Some of the pendants I’ve been doing lately, I love having that part of it getting more free, and seeing the form progress of how you can hang the warp, and play with it as almost like—sculptural or with a lot of structure—because once it’s off the loom—just being able to twist it, and bend it, and see it in different ways.” Another example of her willingness to play with materials was an in-process, oversized scarf on one of the work tables, pieced together with hand-dyed fabric bought from a quilting store. 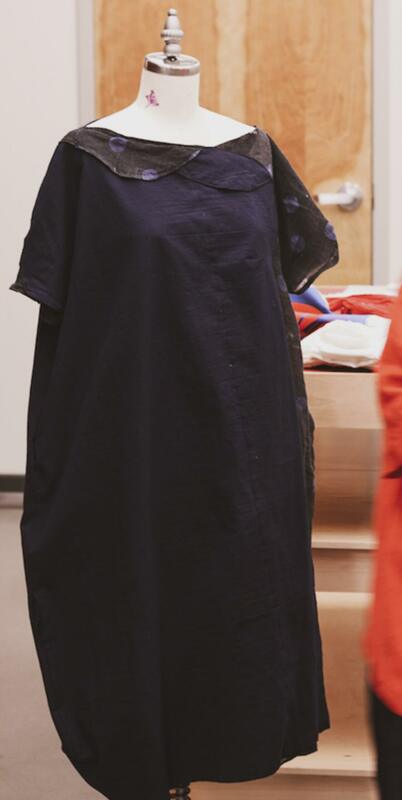 Of the experience, Meghan says, “It was really amazing, because it gave me the opportunity to really explore something I had been thinking about for a long time and expand on it…I used to sew when I was a kid, like in high school, and my mom was sewing my whole time growing up, but I haven’t really been making clothes in a long time,” she revealed. 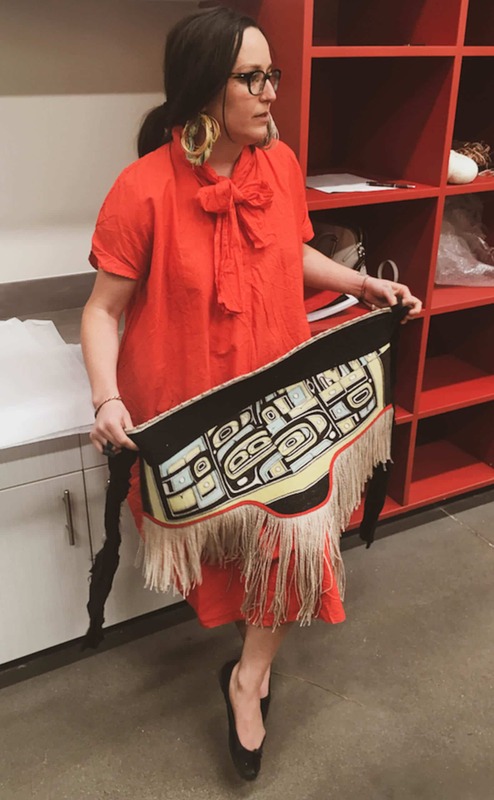 Meghann compared her exposure and approach to fashion to master Haida artist Robert Davidson’s framework of creating through an understanding of a Northwest Coast formline visual vocabulary: “In a different way, I know that Robert Davidson talks about building a database almost of—I don’t think he uses “database”—but like, building this repository of forms—like exposure to art. And I think I’ve had a huge exposure to design in fashion throughout my entire life, because it’s just been an interest for so long, so it’s fun to dig into that. And I consider the clothing more like sketches, or like impressions of clothing, because they’re really not that technically perfect. And I’m not a tailor, or a dressmaker. 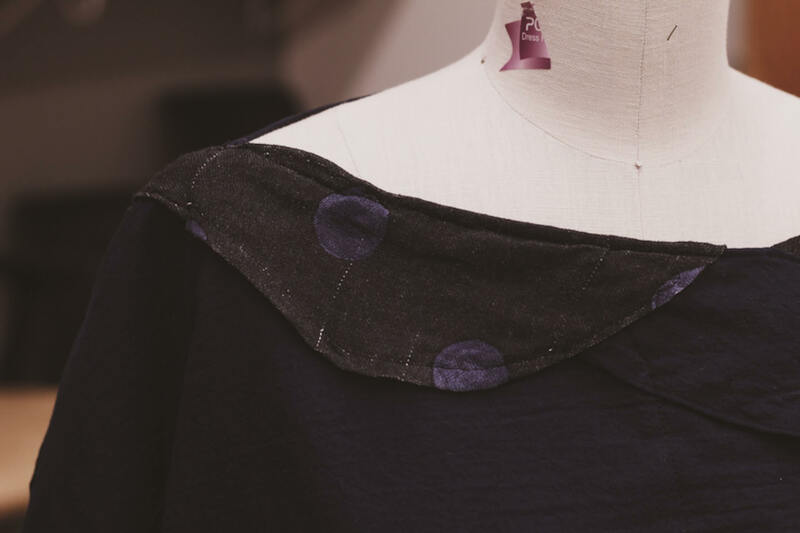 I’m just kind of like, going to town with my sewing machine.” Prior to her experience with the Ociciwan Contemporary Art Collective, she had some other involvements. “I got invited to give a talk at the Museum of Anthropology during Vancouver Indigenous Fashion Week,” she said. “So at the time, I didn’t apply for anything or have anything to show other than my weavings. And that was a good stepping stone just to get my feet wet in that environment and those conversations.” Dene designer Sage Paul, a well-known advocate for Native art forms and founder of Indigenous Fashion Week Toronto, had also shared Meghann’s work through a booklet which she took during a trip to fashion weeks in Europe. A significant part of our conversation involved the discussion of navigating ethical and appropriate usage of cultural practices and imagery in new forms and contexts. Meghann herself had apprenticed under other weavers, and has been working on her own for a few years now. How does one mindfully take risks? Relating to the issues Meghann raised, I talked about my own considerations as an Ojibwe person, particularly the question of how Ojibwe artists utilize sacred imagery of powerful beings in a proper way, while also striving to perpetuate culture. “Yeah, it’s a big question,” Meghan sympathized. 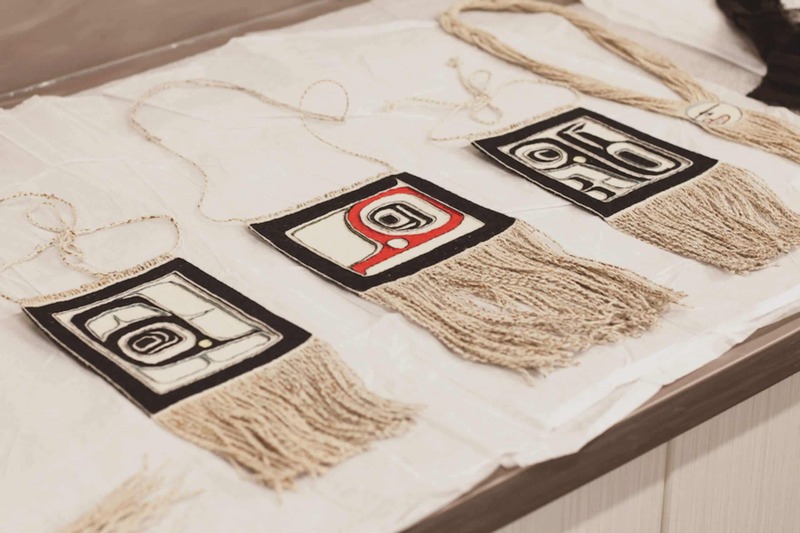 In her personal process, she questioned whether it was appropriate to combine her weaving with Western forms, and we discussed the history of inspiration and syncretism of materials and methods by Native artists. 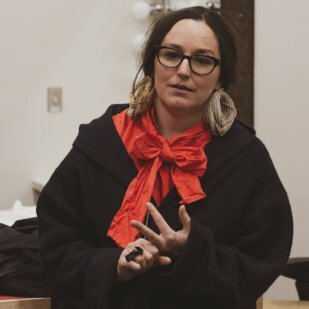 “I started doing this research and I started seeing all these examples of like, in, you know, the 1800s, of how our people have been influenced by Western clothing for so long,” she noted. “And there’s like—it’s nothing wrong with it at all, I don’t think. 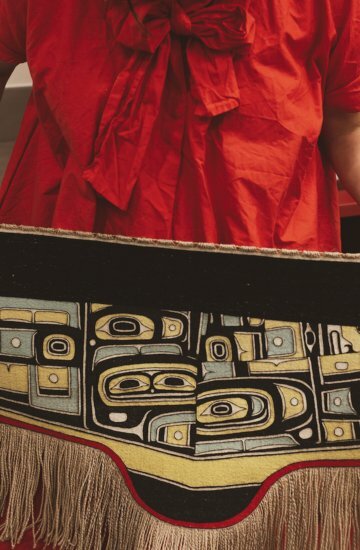 Like I saw a really cool Chilkat blanket that had been cut up and it was tailored into like—they matched the front—it was a vest—and it matched—the patterns, the faces all matched together, and it had the buttons. But it was fully tailored!” She further went on to share some history of her region: “Chiefs on the Northwest Coast used to love wearing or trading for the ships’ captain’s uniform and wearing those, with their Chilkat blanket in the background. It’s so cool.” We discussed how trade and the appeal of novelty has long been a part of Native histories. “If something came from somewhere else, and you could get your hands on it, it was such a status symbol, because nobody else had it,” Meghan said. While exploring different ways of doing things, she rejects the idea of fast fashion, and mentioned associated problems such as poor quality and environmental irresponsibility. “I like the idea of finding a way from new ways to bring things forward into today that are beautiful, and have a beautiful history around them—and keeping that integrity of the work,” she said. 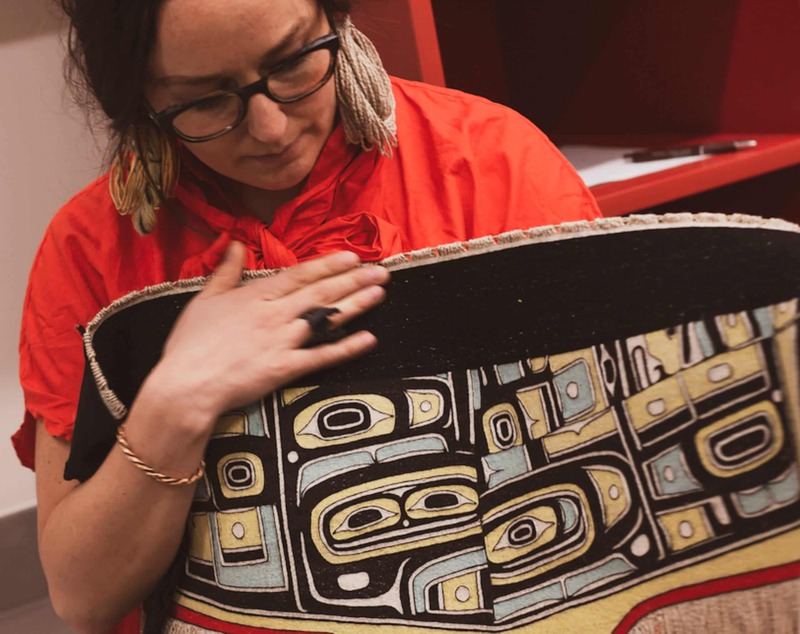 Next year, Meghann O’Brien will again bring beautiful Northwest Coast woven forms to the Southwest as the School for Advanced Research’s prestigious 2019 Eric and Barbara Dobkin Native Artist Fellow. She’ll be in residence from March 1—May 31, 2019. Be sure to mark your calendars, and keep updated on her work through her website, Jaad Kuujus.